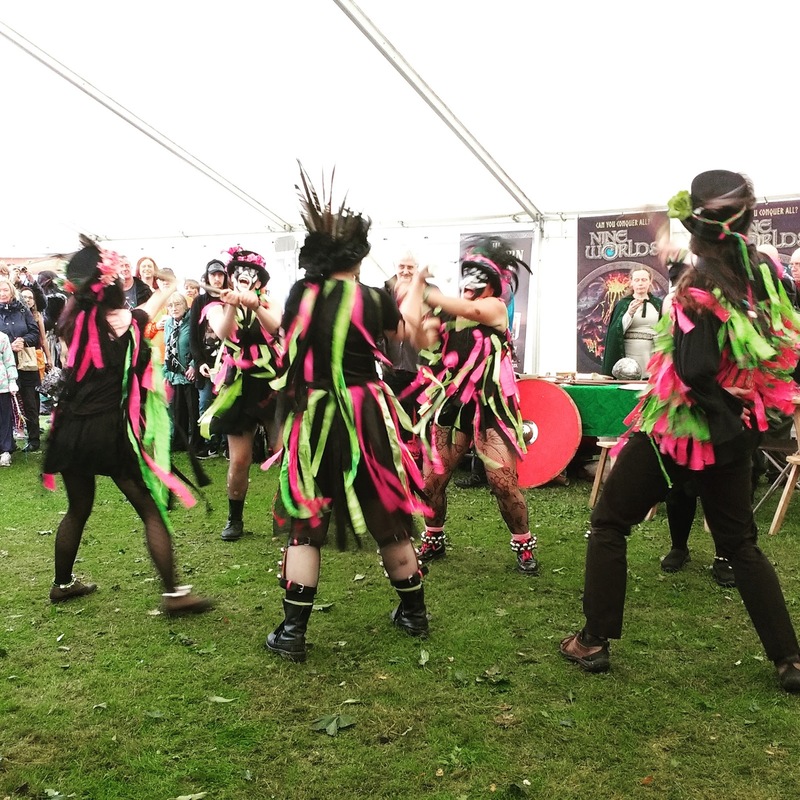 Saturday we decided to do something different and headed over to Sarehole Mill for the Middle Earth Festival, which was essentially some traders, folks in costume and festivities celebrating all things Tolkien. Naturally, the weather decided Saturday was the day to rain and rain and rain and rain. We didn't let that put us off, but it certainly made for a cold, wet day and I suspect prevented a lot of the arena type activities from going ahead. We did see a couple of guys in orc masks and a bit of posturing, but full on skirmishes in torrential rain are never a good idea. Not only would it be uncomfortable, it would be dangerous due to it being very slippery under foot. Sarehole Mill is in Birminghan, so about 40 minutes away in the car. We found the place without too much trouble, parking in the expected field before walking back to the venue. Once inside the first marquee, we briefly looked at 'The Mirk Wood' which M didn't like very much, even when we explained the spiders webs were Hallowe'en props. After that, we sheltered under umbrellas as we looked around. We found a falconer sheltering under a couple of gazebos, accompanied by a young Harris Hawk. The hawk didn't like the rain and was flying within the confines of the gazebo. There were a few owls in his van, but there they stayed only coming out briefly toward the end of the day when the weather let up a little. Owls do not fly in rain. 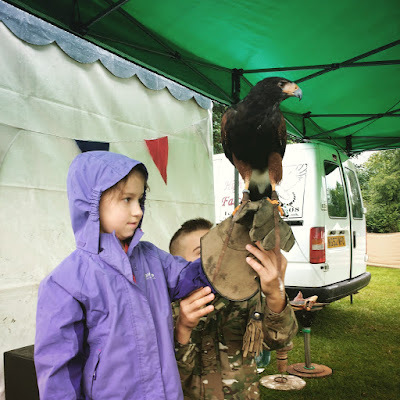 M with a Harris Hawk. After looking at the orcs we wandered around the various tents, examining wares or craft displays. The wood carving tent went down well, where M voted for a cat in this year's competition. We looked at the other pieces on display, with a whale proving to be M's favourite. She told its creator so at length, telling him he should make more pieces just like it. 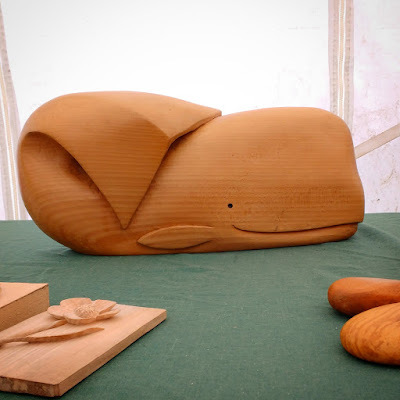 The woodcarver turned the whale around, suggesting it could also be an elephant, but M gave him a hard stare. He eventually conceded it was better as a whale. Morris dancers also went down well. But not this man, who shouted a lot. As part of his patter he approached M with a bag of lollies, at which point she carefully stepped behind me! I declined the offered sweets politely so he moved on, finding lots of other takers for his lollies. We spent most of the day looking at the crafts on display. Lots of pretty things were admired and we bought some pretty stones. As I remarked to M and Dave, we really do need to make some jewellery as I have a fair few bits now. M spent some time in the children's tent, colouring and making a wand. 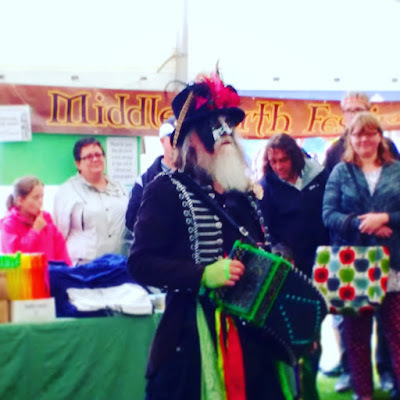 We talked to some re-enactors, from whom I learned about a spinning tool for beginners called a 'dizzy sheep' and another one called a 'spurtzleur'. These two tools are apparently mobile and suitable for those who can't get along with a drop spindle, so might be good for teaching children to spin. M talked to several of the traders about their wares. In one case and to our complete surprise, one stall holder suddenly gifted M with a nightlight. The lady in question was very taken with M who had charmed her with her observations, admiration and general friendliness. She asked M which was her favourite piece on the stall (an Alice In Wonderland nightlight), then gave it to her! The event closed at 5pm and we headed for the car at about 4:30pm, all of us tired and cold. We did stop off at the shops and Hobbycraft on the way home, but ran out of time so decided to go back on Sunday. I had spotted that Hobbycraft had a sale on, with a lot of art supplies at half price! Not a bad way to spend a rainy September day.